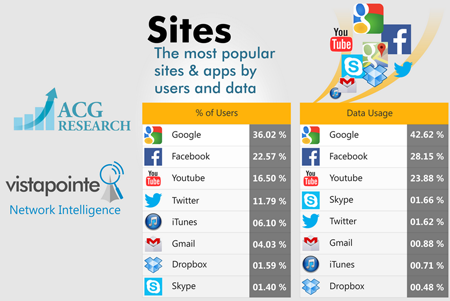 Data published by ACG Research reveals that Google, Facebook and YouTube dominate in terms of mobile traffic carried by a Tier 2 mobile operator in North America. Traffic analysis was provided by Vistapointe, which specializes in cloud-based and business intelligence solutions for mobile and enterprise Wi-Fi operators. Consumption of multimedia applications (YouTube, Netflix, and ESPN) is approximately 70% of total usage; capping of unlimited data plans has led consumers to consciously move toward using multimedia apps, mostly smartphones, while on Wi-Fi coverage. Utilities traffic is approximately 25% of the total data: Signaling (GTP attach, detach messages & PDP context activations) and IP control plane & session establishment traffic, initiated by smartphones; mobile carriers have been inaccurately complaining about smartphone control and signaling traffic, claiming that it is huge. Apple, Google &Microsoft are emerging as the smartphone OS app store leaders: Google dominates in the mobile application ecosystem, both from data traffic consumption and percentage of users; Facebook is second in data traffic consumption and percentage of users. Vistapointe, which is a start-up based in San Ramon, California, offers a Mobile Analytics and Business Intelligence solution for 3G and 4G networks. It non-intrusively taps into data and signaling layer interfaces to offer actionable insights that can be leveraged to profile mobile data customers dynamically, optimize the RAN and packet core backbone to enhance QoE, and identify opportunities to drive marketing programs and create innovative new service plans. The Brazilian Network Information Center (NIC.br) has deployed Cisco 100 Gbps IP and IP/DWDM technologies to expand the PTT.br Internet Exchange’s largest facility. The deployment features the Cisco ASR 9000 Series router and covers Sao Paulo and other major cities. The network will include VPLS (virtual private LAN services) and IP over DWDM at 100 Gbps. The Sao PauloNIC.br PTT.br backbone, which connects more than 400 autonomous systems from Brazilian states and other countries, has seen a significant increase in bandwidth requirements driven by the growing high-speed Internet service and the number of subscribers in the Brazilian market. Cisco said its upgrade ensures NIC.br can meet its growing Internet Protocol capacity needs without forcing an upgrade to any existing fiber infrastructure. NTT DOCOMO passed the 15 million subscriber milestone for its Xi LTE service on July 30. DOCOMO first launched its commercial LTE service on December 24, 2010. Subscribers reached one million in December 2011, 10 million in February this year and now, just five months later, 15 million. The company said growth had accelerated thanks to successful promotions for its new summer lineup, including special discounts introduced in May for the extra-popular Xperia A SO-04E and GALAXY S4 SC-04E models. In July, NTT DOCOMO announced plans to push its LTE service to 150 Mbps maximum downlink rates, roughly double today's top performance. The 150 Mbps service is currently being verified in Kawasaki, Kanagawa Prefecture. 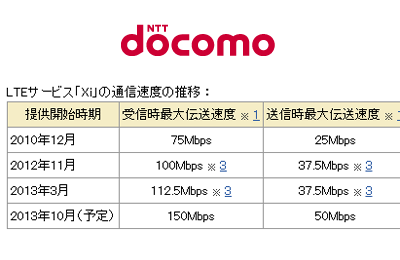 DOCOMO, in addition to steadily improving the quality of its LTE network for increased reliability, continues to upgrade LTE coverage and data transmission speeds, most recently by expanding 112.5 Mbps downlink service to more than 130 cities as of July 2013. True, a communication service provider in Thailand, has selected Huawei's 5000E core router for its 3G IP core network. The NE5000E supports flexible networking of 100GE ports, 40GE ports, and 10GE ports for backbone networks. Financial terms were not disclosed. "Traffic on the backbone network increases explosively as mobile broadband services and video services develop dramatically. It's time for the 400G technology to apply to live networks. Huawei leads the 400G technology and provides solutions that facilitate network capacity expansion and remove bandwidth bottlenecks, helping carriers construct Future-oriented backbone networks," said Mr. Gai Gang, President of Huawei Carrier IP Product Line. CommScope filed a registration statement with the U.S. Securities and Exchange Commission for a proposed initial public offering of its common stock. CommScope is a leading global provider of connectivity and essential infrastructure solutions for wireless, business enterprise and residential broadband networks. In July 2013, CommScope acquired Redwood Systems, a start-up offering LED lighting solutions and integrated sensor networks for data centers and buildings. Financial terms were not disclosed. Redwood Systems, which was based in Fremont, California, developed what is believed to be the world’s first smart building platform that powers and controls lights with a high-density sensor grid. This platform provides granular monitoring of space utilization, temperature and power consumption. CommScope said the acquisition advances its position in intelligent building infrastructure solutions. In 2007, CommScope acquired Andrew Corp. in a deal valued at $2.6 billion at the time. Andrew provided wireless solutions for antennas, cable products, base station subsystems, in-building and distributed coverage, geolocation systems and satellite communications. Endurance suffered a network outage at its datacenter in Provo, Utah that impacted many of its Bluehost, HostGator, HostMonster and Just Host throught the day on Friday, August 2nd. The company said a hard failure during routine server maintenance quickly cascaded throughout the network. The Multicore Association, which develops standards for products with multicore processors, has formed a new working group called the Software-Hardware Interface for Multi-Many Core (SHIM) to provide a common interface to abstract the hardware properties for multicore tools. The association said better development tools are needed to support the virtually unlimited number of processor configurations coming to market. "Unlike the IEEE IP-XACT standard that defines and describes electronic components for hardware design, the primary goal of the SHIM working group is to define an architecture description standard useful for software design. For example, the processor cores, the inter-core communication channels (in support of message passing protocols such as the Multicore Association’s MCAPI), the memory system (including hierarchy, topology, coherency, memory size, latency), the network-on-chip (NoC) and routing protocol, and hardware virtualization features are among the architectural features that SHIM will either directly or indirectly describe. The SHIM standard will be flexible enough to allow vendor-specific, non-standard architectural information for customized tools. And, while the SHIM standard itself will be publicly available, the vendor-specific information can remain confidential between a processor vendor and its development tool partners." SingTel and Visa announced a deal to link Visa prepaid accounts to mCash, SingTel’s mobile money solution. The forthcoming service will allow SingTel mCash customers to wave and pay with their NFC-enabled smartphones for daily necessities such as coffee, fast food, groceries and movie tickets at Visa payWave acceptance points. There are currently more than 12,000 Visa payWave acceptance points in Singapore and over 100,000 across Australia. Service launch is planned for early 2014.